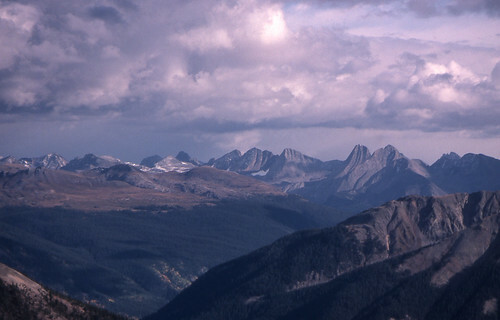 Photo of the San Juans by borga used under a Creative Commons license. Rick Bass, The Lost Grizzlies: A Search for Survivors in the Wilderness of Colorado (Houghton Mifflin, 1995). Generally understood to have been extirpated from their historic range throughout the Lower 48 States save for isolated populations around Yellowstone and Glacier National Parks, grizzly bears have nonetheless been rumored to still hold out in the San Juan Mountains of southwestern Colorado. Along with bear expert Doug Peacock — a larger-than-life character better known as the model for Hayduke in Edward Abbey’s The Monkey Wrench Gang — and biologist Dennis Sizemore, Bass hiked into the San Juans to search for grizzlies. Here is Google Book Search. The Mississippi Writers Project has biographical information about Bass. Thomas McNamee reviewed it in The New York Times. Mark Mardon reviewed it in Sierra. Here’s a capsule review from Entertainment Weekly. In Sandpoint Magazine, Dennis Nicholls writes about grizzlies. Bass wrote this piece about the bears for Time in 2002. Here’s a 2006 report of a grizzly sighting in the San Juans. Photo by Julien Harneis of South Kivu, Congo, used under a Creative Commons license. Mike Tidwell, The Ponds of Kalambayi: An African Sojourn (The Lyons Press, 1996). Tidwell was a wet-behind-the-ears 23-year-old fish-culture expert with the Peace Corps when he was sent to the tribal chiefdom of Kalambayi, in Zaire, to teach the benefits of fish farming. The story this fish out of water tells about working and living with locals is both funny and heartwarming. William Grimes reviewed it in The New York Times. American University links to related material. Here are some reviews at peacecorpsonline.org. Judith at the Concord Free Public Library recommends the book. And this profile by Ralph Brave describes what Tidwell has been up to since the book came out. 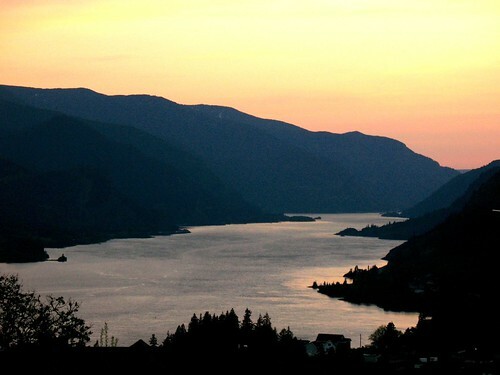 Photo of the Columbia River by Starlisa used under a Creative Commons license. Blaine Harden, A River Lost: The Life and Death of the Columbia (W.W. Norton & Co., 1996). When Woody Guthrie wrote his songs about the Columbia River during the Great Depression, hydroelectric projects like the Grand Coulee Dam were taming a wild river to bring jobs and electricity to a region that didn’t have enough of either. Harden’s father, like my grandfather, was one of the beneficiaries. Dams allowed barges to carry freight where rapids had been; irrigation made the desert bloom. Decades later, the Columbia is a river tamed, and the costs of this progress, such as declining salmon runs, are more evident. Harden, who grew up along the river and became a reporter for the Washington Post, traveled up and down the river to draw this picture of the river and the region. Here is Google Book Search, with an excerpt and more. Here’s a story about Harden and the book in the Kitsap Sun. Phil Keisling, Oregon’s Secretary of State, reviewed it for Washington Monthly. Hal Espen reviewed it for The New York Times. The road from Leopardwood Downs. Photo by Magic Foundry used under a Creative Commons license. Roger McDonald, Shearers’ Motel (Picador, 1992). 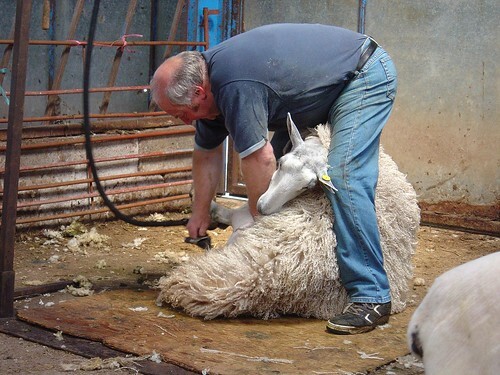 Wrestling with a yearning he is hard put to explain, in1989 McDonald left his family and farm to be the cook for sheep-shearing crews, a position for which his ancient 1-ton truck was a bigger asset than his inexperience counted against him. As the “cookie,” he prepared several meals a day for a half-dozen or more shearers for stints of a week or twoat remote sheep stations across New South Wales, South Australia and Victoria. Shearers are a crusty lot, and his account is full of terrific characters with names like Davo, Quinn, Wade, Bertram Jr., and Louella. 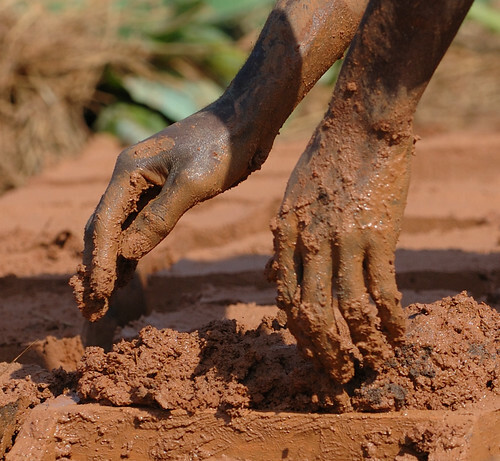 Many of them are Kiwis, Maoris come over to a vast, dry, red-rock country to earn a dollar. I just adore this book, and if it’s hard to track down a copy, rest assured that it’s worth it. It won the 1993 Banjo Award for Non-Fiction. Here is Wikipedia’s page on McDonald. Perry Middlemiss posted the synopsis from the dustjacket and the book’s first paragraphs. In 2003, Libby Robin reviewed Wood: The Asutralian Story; she says it’s not as good as Shearers’ Motel, but her review gives some sense of the Australian wool industry. Buy it now at Amazon.com. If that link no longer works, you might try Boomerang Books or another Australian bookseller. Photo by Peter Garnham used under a Creative Commons license. David A. Mason, Spirit of the Mountains: Korea’s San-Shin and Traditions of Mountain-Worship (Hollym International Corp., 1999).
. . . Mason spent the last 20 years putting in trail miles and doing fieldwork devoted to his research of mountain shamanism. His book . . . offers a revelatory look at how this native religion is quietly practiced at individual shrines and Buddhist temples across the country. San-shin, a mythical persona, is depicted as a wizened white-bearded sage who inhabits the mountain valleys, creating sacred spots of power and spirituality. 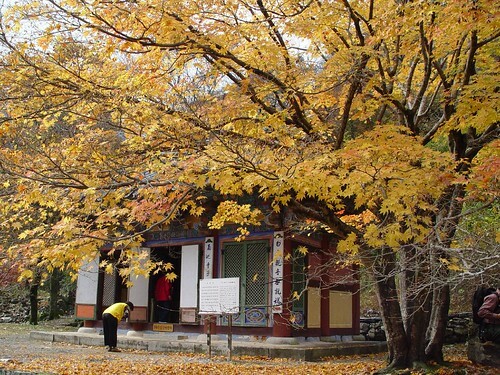 In the first sentence of the book he writes, “Right at this moment, as you read this page, no matter what time or season it is, mountains are being worshipped in Korea.” Mason dissects the iconography of tigers, pine trees and ginseng, and the book doubles as a travel guide to the shrines. Many guidebooks will tell you a thousands facts about a famous Buddhist temple, yet Mason’s book teaches you to explore behind the temple and follow a jagged path in the woods that leads to a weathered stone altar dedicated to the spirit of the mountains. Mason’s web site has a whole lot of interesting stuff on it, including biographical information. This article about Mason seems to have run first in The Korea Times. Here’s a review by John Synott. And Brendon Carr recommends it. Here’s a lengthy discussion at The Well with Mason about the book. Mason prepared this annotated map of sacred sites in Korea. And here are more writings by Mason on the web site of the Korea Branch of the Royal Asiatic Society. Buy it at Amazon.com (but n.b. — Amazon appears to think that the book’s author is named “Weatherhill”). Photo by bradburyjason used under a Creative Commons license. Ruth Earnshaw Lo and Katherine S. Kinderman, In the Eye of the Typhoon (Harcourt Brace Jovanovich, 1980). A memoir of the Cultural Revolution by an American woman, Ruth Lo, or Xia Luteh, who had married a Chinese man, Dr. Lo Chuanfang, in 1937 and lived there for forty years. 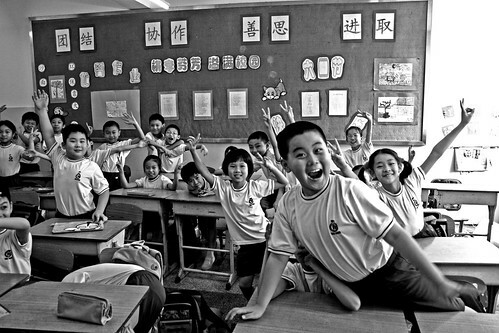 They were at Zhongshan University in the suburbs of the city then called Canton and now called Guangzhou. From the uncommon perspective of a Westerner inside China, she writes about the period from 1966 to 1978. Lo and her family were ostracized because of their Western connections, and her husband died after he was denied medical treatment. Here is a review by Jun Zhang, who suggests that Lo’s status as a foreigner makes the book distinctive but also leads her to misconstrue some events. If you have JSTOR access, you can read this review by Steven I. Levine in The Journal of Asian Studies. Image by marcia.furman used under a Creative Commons license. Zee Edgell, Beka Lamb (Heinemann, 1986). Awarded the Fawcett Society Book Prize as the first novel by a Belizean writer to reach an international audience, Beka Lamb details a few months in the life of 12-year-old Beka, a thoughtful yet mischievous girl coming of age in colonial, multiethnic Belize. The melodious creole voices of many of the book’s characters charge to the surface in this atmospheric and very accessible novel about everyday life among the cays of Belize. Here are a bio on Edgell’s website and Wikipedia’s page about her. Google Book Search has an excerpt and other resources. Bernardine Evaristo interviewed Edgell in 2003 for BOMB magazine. A year later, BELIZEmagazine.com interviewed her. Katie Horan wrote this review. Liam didn’t particularly care for it (scroll down). Here is a recommendation and other recommended Belize reading, and here is another such list. Nicholas has the novel’s opening line here, and nine other first lines from Caribbean novels. Cristen L. Garner writes about Edgell and other Caribbean women writers.